After the completion of the hectic Smartphone Round Robin, your faithful bloggers at Smartphone Experts decided to keep things moving along at a heady clip. In the past week we have published somewhere in the neighborhood of 175 stories, from accessory and software reviews to news to the latest rumors. That's a lot to keep track of, so we're bringing back our regular "Around SPE" feature to give you a quick summary of what you may have missed in a format that's more helpful than just a list of links. In that vein, our biggest recent news is that our newest sister site, Nokia Experts is starting strong with a launch contest. If you would like to earn some chances at winning a Nokia E71 or Nokia N85, make sure to enter the contest each week. There are two weeks left to go, so check back as each week we're changing up how you can enter to win! There's plenty more smartphone news you may have missed, so read on! The big news over at Android Central is the new Android firmware upgrade. The update includes Google Latitude, Voice Search, and much, much more. If you're interested in trying the new version of Android and don't want to wait for your official update, we tell you how to install it here. Meanwhile we're tracking some potential new Android devices from the likes of Samsung, HTC, and maybe even Dell and Acer. We're expecting there will be a huge number of Android devices hitting in 2009, so stay tuned! In the BlackBerry world it was a week for the Storm owners. On the operating system front, they got an unofficial update leaked out amidst a flurry of rumored versions of upcoming ROM improvements. On the app front, while everyone awaits the launch of the BlackBerry App Store, the effects of app mania are already setting in. A Storm-ified version of Slacker Personal Radio was released and over the weekend the first BlackBerry Lightsaber app emerged. Keep your eyes on CrackBerry.com this week for a Fart App Roundup. Seriously. Besides the above-mentioned launch contest, we already have some reviews up, including ones for Spb Wallet 2 for S60, Nokia N79 first impressions, and a full review of the new 5800 XpressMusic touch screen S60 device. You will find some great content and discussions going on over on Nokia Experts with thoughts on why Nokia is not a major player in the U.S., why Nokia's Download! utility drives me crazy, some of my favorite S60 applications, and what motivates me to use Nokia and S60 devices on a daily basis. Come visit and participate in the active discussion. This week TiPb brought you more iPhone 3.0 speculation and also pondered the possibility of improved multitasking on the iPhone. We also asked "What do you want in MobileMe Take 2?" The headliner for the week had to be Google, though. So we took a look at Google's new Latitude feature in Google Maps and their new web-based Tasks functionality. Google also brought us an incredible new Books web interface for the iPhone, which got us thinking: might we see an Amazon Kindle app for the iPhone? 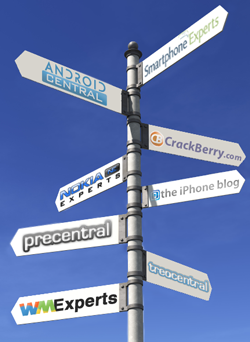 Over at PreCentral.net we are still trying to pin down just when when the darn Palm Pre is going to be released. While realistic expectations and recent reports suggest a May release, we've received umpteen users reports that Sprint representative are still telling users that the Pre will be launched on February 15th. A date that early seems as likely as free money delivered by unicorns, but we'll be watching it nonetheless. Meanwhile we're starting to help get out users pre-pared for the Pre by discussing how to get your data off your PC and into the cloud. We started with the Mac, but the PC and even Linux are coming soon, so be sure to check back. Over at TreoCentral we learned that a SEC 8K form filed by Palm has revealed that Elevation's $100 million equity deal gave them the right to appoint an additional director for election on Palm's board. Donna Dubinsky, Palm's former CEO and one of the original founders, offered her resignation without any disagreement. Elevation nominated Rajiv Dutta in Dubinski's place. We also learned this week that a Sprint EOL document revealing that the Sprint Treo 755p will be "End Of Life'd" around May and replaced by the Palm Pre. Of course, our forums have been on fire with users reporting that Sprint reps are telling them the Palm Pre will be released on February 15th. WMExperts began to feel the exitement surrounding this month's Mobile World Congress with previews of new devices such as the Toshiba TG01 and Acer DX900. We also saw the time table for Windows Mobile become better defined, while leaks of version 6.5 keep popping up. Last but certainly not least, we learned more about Microsoft's Skybox service and that we might be calling it My Phone.